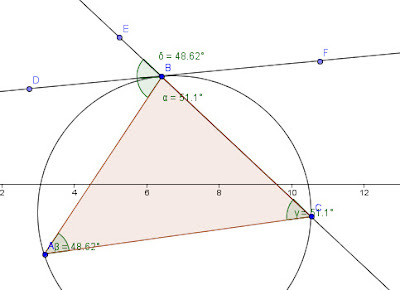 I would think it is pretty fundamental in typical HS classrooms that students recognize that a line parallel to one of the sides of a triangle will cut the other two sides in a pair of angles which are congruent to the angles formed at the third side. Eventually they can prove that the triangle formed by the parallel line forms a triangle with the two sides similar to the original triangle. Almost none of them, and perhaps very few of their teachers, know that there is a second type of line which can be drawn to cut the two sides which will also form a similar triangle, and thus must also form angles congruent to the two base angle of the original triangle. Its called the anti-parallel now, but it used to be called a subcontrary line, at least by Apollonius. There are several nice ways to produce an antiparallel in a triangle. A nice general way is to use the two vertices of one leg and a point on one of the other two legs to construct a circle. The circle will then cut the other leg in a fourth point which is the other vertex of the antiparallel. These four point are the vertices of a cyclic quadrilateral, for which the opposite angles are supplementary. This makes it easy to see that the antiparallel forms angles on one leg congruent to the original angle on the other leg. A second way is to draw an altitude from two of the vertices to the opposite sides. The segment connecting the feet of these two altitudes is also antiparallel to the third side. Just as the median bisects all lines parallel to the base, its reflection in the angle bisector (called the symmedian) will bisect each anti-parallel. The antiparallel shows up as the solution to an optimization problem that was first proved by Giovanni Fagnano in 1775: For a given acute triangle determine the inscribed triangle of minimal perimeter. Turns out the answer is the triangle formed by the three anti-parallels connecting the feet of the three altitudes, called the orthic triangle. For slightly more advanced students who have been exposed to cones it is constructive to point out that for an oblique circular cone, (one in which the axis is not perpendicular to the base; and many students graduate from HS without ever having been made aware that such types of cones exist, much less those whose base is non-circular) there is more than one plane which will cut a circle. A cutting plane parallel to the base is one type, and of course by now you suspect that the other type is a plane anti-parallel to the base. Maybe soon I'll write about the anti-CENTER. Addendum: After a comment by 1SAEED9, I realized that the proof that the tangent at the vertex opposite a side is antiparallel to that side. It is easy to see that angles DBA and BCA both subtend the same arc, and thus are the same measure. By using the fact that CBA, DBA and EBD add up to 180 degrees, and the three interior angles of the triangle CBA, CAB, and BCA also add up to 180 degrees. Since BCA and DBA are congruent, when we subtract these from each side, and remove CBA from both sides we are left with the fact that EBD must be congruent to CAB. We can repeat this process on the opposite angle and we are done. Easier than I imagined.